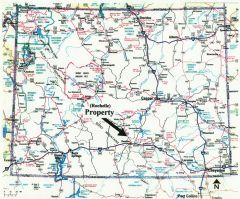 Description: Phone every real estate broker in all 50 states and ask if any of them have 320-acres for sale for less than $195 per acre! History proves it is literally impossible to lose money owning land if purchased cheap enough and held long enough. With coming inflation prices like this will soon disappear, so act now while still available! Price: $62,400 ($195/ac) with $2,400 down and the balance of $60,000 payable at $504 per month (amortized over 25 years including 9% interest with no prepayment penalties or credit checks). Access/Roads: This property is located in the checkerboard area (meaning sections with ownership alternating between private and the federal government) and access is per long standing BLM (Bureau of Land Management) policies (meaning private owners can cross BLM land to get to private property but the public can’t cross private lands to get to BLM property). An actual road, however, may or may not exist at this time. 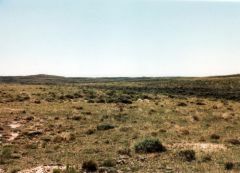 Mineral Rights: As with most oil producing states the mineral rights have been owned by the exploration companies for many years but a landowner would receive some form of compensation if wells were ever drilled. 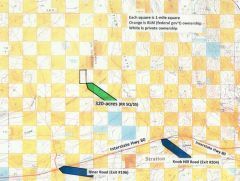 Surveys: All sections were surveyed by the federal government at some time in the past but private surveys for individual 320-acre tracts have not been completed. 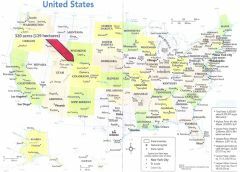 Zoning: The property is zoned agriculture and if additional usage is anticipated you should contact Sweetwater County Planning & Zoning Dept at (307) 872-3914. Directions: From Rawlins, WY drive west on I-80 approximately 16 miles to Riner Road (Exit 196); take Riner Road to the north and observe the arrow on the parcel map pointing to the property (remember that each square on the map represents one square mile); there will be a sign on Riner Road stating “No Public Access” but that doesn’t apply to property owners, only the public in general. ® 2009 Cheap Land in America, Inc. All rights reserved.